It's publication day for 'Chicken on the Roof', written by Matt Goodfellow and illustrated by me! It was such a joy to illustrate these hilarious and beautiful poems. Many thanks to the publishers Otter-Barry Books. I was recently commissioned to illustrate the ActionAid film 'The Story of Hope', narrated by BAFTA award winning actor Anna Maxwell-Martin. 14 million girls worldwide could face the new year without a home, because they have been displaced by humanitarian crises. Based on the experiences of girls ActionAid works with in countries affected by conflict, the film shows how child sponsorship can make a difference. I was recently lucky enough to be commissioned to create a series of illustrations for Floreat Education's pioneering Character Programme, funded by the Department for Education. The programme aims to give pupils the knowledge and experience of making the right decisions for the right reasons by identifying 18 character virtues (for example: bravery, self control, perseverance) that children will learn about every year. Floreat asked me to create three sets of illustrations (one for the Reception class, one for Year 1 and one for Year 2) for teachers and children to use in the classroom as the basis for a rich class discussion about virtues. Below are six of the final illustrations for Year 2. I'm excited to announce that I’ll be exhibiting at the House of Illustration Illustrator's Fair ‪on Saturday 12 December! Come down to Granary Square for a packed day of market stalls, Christmas gift inspiration, drop-in workshops and lots more. Further details on the House of Illustration's website. I have just finished a commission for Blind Children UK, who are campaigning to highlight the importance of eye tests for young children. They have produced an online children’s book, Olly’s Eye Test, about a boy’s first trip to the optician, which they asked me to illustrate. On Thursday night my exhibition at the 14th century bathhouse in Kulmbach, Germany, opened to the public. The opening was celebrated with a summertime 'night of culture', which also featured music, theatre performances, readings and the opening of an exhibition by the artist Owen Normand. Over 150 people attended the event and it was fantastic to be part of it. Here are a few photographs of the exhibition and event. I'm very excited at the prospect of my first exhibition in Germany, which opens in just a couple of weeks. The exhibition is being held in a medieval bathhouse in Kulmbach in Southern Germany. The exhibition runs from 14 August - 20 September, with a private view on 13 August. Come along if you happen to find yourself in the Bavaria area! I'm very excited to introduce my new agent Davinia from Andlyn Literary Agency! You can find out more about her agency here. A page from my sketchbook has been featured online by the Society of Children's Book Writers and Illustrators... see hippo doodles below! The limited edition prints I created for New York Tartan Week are now available on Scotland Now's online shop too! Check them out here. 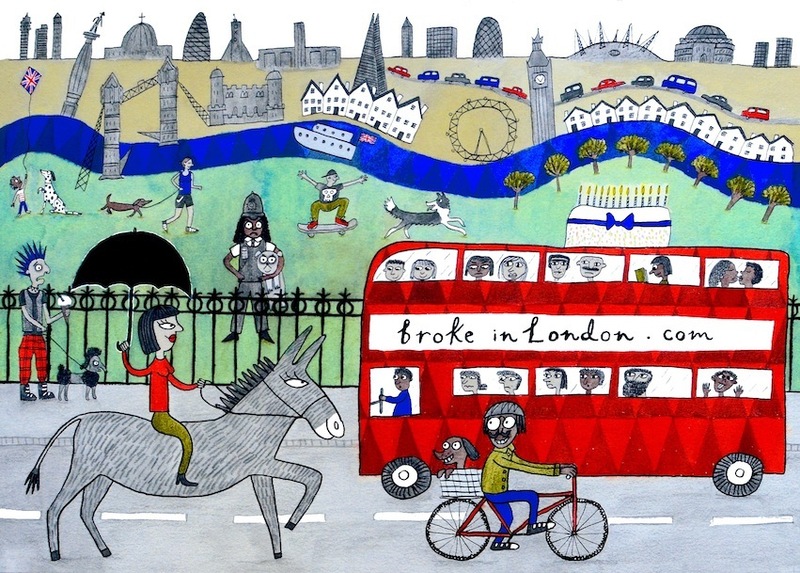 Today BrokeinLondon (an essential resource to living in the capital with empty pockets) is celebrating its two year anniversary in the digital world! I was commissioned to create the poster below to mark the occasion. I am delighted to have been selected to sell my illustrations as limited edition prints on New York Tartan Week's online shop! You can find my prints for sale here, including two prints designed exclusively for the shop (pictured below). All the prints are A4 giclee prints on 300g archival paper, individually signed and numbered. Every year there is a world-wide competition to design sardines for 'Festas de Lisboa' – festivities held every June in Lisbon. During this month the Portuguese capital goes sardine crazy in honour of St Anthony who was famous for preaching to these fish (they were better listeners than most). Along with street parades, music, dancing and feasting, there are also mass weddings at St Anthony's church. Which sardine floats your boat? This is one of five images created to illustrate Goethe's poem Der Zauberlehrling (The Sorcerer's Apprentice). The illustrations will be used as a study aid for a primary school class. Happy year of the horse and welcome to my new blog! This pencil sketch was inspired by the beautiful ink drawings of David Roberts (one of my favourite illustrators) for The Wind in the Willows. "No animal, according to the rules of animal-etiquette, is ever expected to do anything strenuous, or heroic, or even moderately active during the off-season of winter. All are sleepy — some actually asleep." Enjoy the off-season while it lasts!